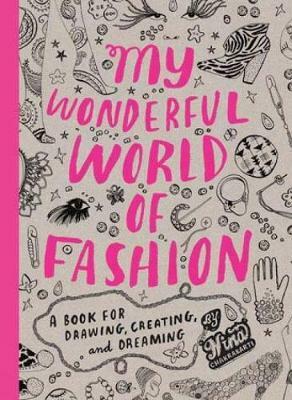 An interactive colouring book for fashionistas of all ages, "My Wonderful World of Fashion" is packed with beautiful and sophisticated illustrations specially created by the leading fashion-illustrator Nina Chakrabarti. The book encourages creativity, with illustrations to colour in and designs to finish off, as well as simple ideas for making and doing (how to make a sari, turn a napkin into a headscarf, dye a t-shirt, etc.). Covering clothing, shoes, bags, jewellery and other accessories, the illustrations span both vintage fashions, drawing on beautiful and interesting objects from past ages, and contemporary designs from the illustrator's own imagination. 'Did you know...?' features giving brief historical notes encourage children to be inspired by history and by the fashions of other cultures. A wonderful celebration of fashion, the book will appeal to addicts from 8 years plus. Nina Chakrabarti is an illustrator based in London. She was born and spent her early life in Calcutta, India, then studied illustration at Central Saint Martin's College and The Royal College of Art, London. Her work is often concerned with collections and the composition of objects. She works using Rotring pens, felt tips, biros, pencils, ink, and the computer. Her clients include Habitat, French Connection, Vogue, and Marks and Spencer.